First, we practice Downward Dog pose. Most know this one and have done it before. But then we pause — noticing how the backs of our legs feel in the beginning of class. We move on to the rest of class — making sure that we’re active, getting moving, and our bodies are warmed up to stretch. Then, everyone gets a yoga strap. HUH? What are these? A common reaction! 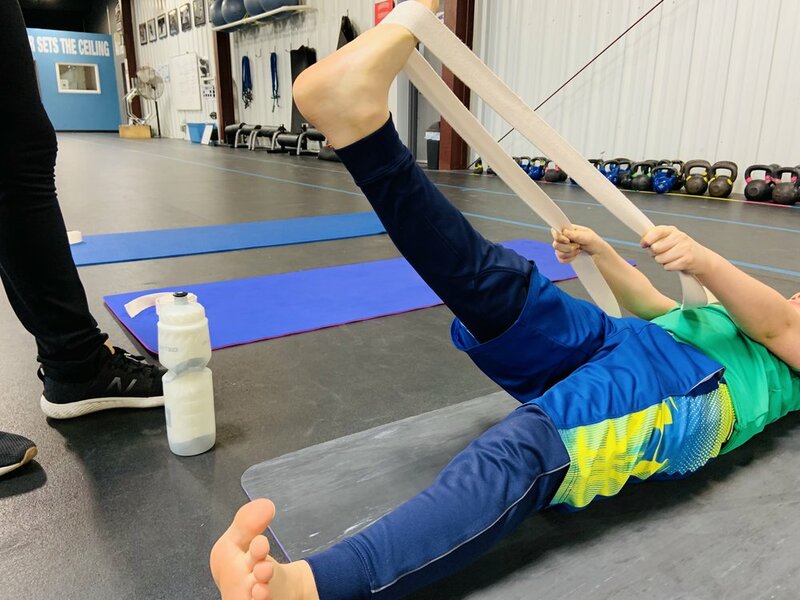 We learn how to use yoga straps, how to hold them, and how long to hold our stretch. Then, back to Downward Dog. We pause, taking notice of how different our legs feel now. It’s a light bulb moment! As we continue to practice, we see better flexibility, good form, and it even helps with injury prevention. The pics above are from an Athletes class, but we modify and use a similar technique with yoga straps in all classes. Happy Super Bowl Sunday, friends. Cheers to a good week ahead! PS. Don’t forget! Tween Yoga + Chocolate Class this Thursday. And Friday Night Yoga Club this Friday! Open Level Flow (adult) with Gina at 6:00 - 7:00pm (Fairport). Enroll here. Ages 3-5 at 9:30 - 10:30am (M/Body Rochester). Enroll here. M/Body Barre or Circuit adult classes at 9:30 - 10:30am. Enroll here. TWEEN Yoga + Chocolate Tasting Class (ages 8-13). Yoga, chocolate, crafting, and Athleta goodies. 6:00 - 7:30pm (Fairport). Learn more and enroll here. FRIDAY NIGHT YOGA CLUB (ages 5-12). Kids night out! Yoga, dinner, disco ball party, and parent perks. 6:00-8:00pm (Fairport). Enroll here. Ages 8-13 at 4:00 - 5:00pm. Enroll here. Teen/Adult at 5:00 - 6:00pm. Enroll here.